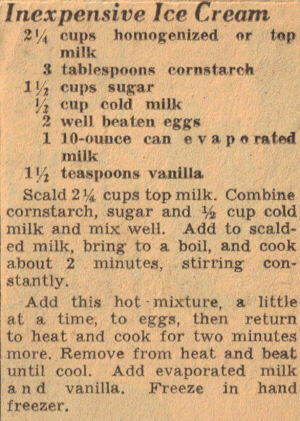 This vintage recipe was clipped from a newspaper, date unknown but the phone number listed at the bottom of the clipping is only 6 digits with both letters and numbers used, so it’s a few decades old. Recipe is typed below along with a scanned copy. Scald 2 1/4 cups top milk. Combine cornstarch, sugar and 1/2 cup cold milk and mix well. Add to scalded milk, bring to a boil, and cook about 2 minutes, stirring constantly. Add this hot mixture, a little at a time, to eggs, then return to heat and cook for two minutes more. Remove from heat and beat until cool. Add evaporated milk and vanilla. Freeze in hand freezer.